The Data Wars: A New Hope? The ongoing Data Wars between the state’s two largest school districts and the Tennessee Department of Education continue, with today being the deadline set by Commissioner Candice McQueen for districts to hand over the data or face consequences. Yesterday, Anna Shepherd and Chris Caldwell, chairs of the Boards of Education in Nashville and Memphis respectively, penned an op-ed detailing their opposition to the data demand from McQueen. Tennessee Education Commissioner Candice McQueen has demanded that Metro Nashville Public Schools and Shelby County Schools surrender personal contact information for a large number of students and families in our school systems, which represent approximately 20 percent of Tennessee’s K-12 public school students. Her argument: A new state law requires us to hand over personal information to ASD charter schools so these taxpayer-funded private schools can use the data to fill thousands of empty seats by recruiting students away from public schools. In addition to violating student and family privacy — the right to privacy is a fundamental American principle — the problem with McQueen’s data demand is this: The ASD now is universally viewed as a failed experiment in education reform. Instead, McQueen proposes to shift the cost burden of the failing ASD to local taxpayers in Memphis and Nashville. She wants to confiscate our student data and information in order to stage marketing raids on our schools — which would redirect local taxpayer funds to the ASD and its charter operators at the expense of our school systems. With today’s deadline looming, it appears school leaders in Memphis and Nashville are locked down against releasing the data demanded by McQueen. Should that position hold, the question will be: What will McQueen do about it? Will she unleash her ultimate weapon and withhold state funds from these districts as punishment? Jason Gonzales at the Tennessean has a report out today that shows that there have been almost 400 complaints on MNPS bus drivers from August to January. These complaints range from not picking up students at the correct bus stop to some very serious accusations. One case in the six-month span included an allegation against a bus driver of inappropriate communication with a student. 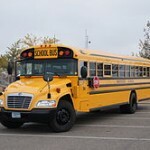 “Mom wants to report what she thinks may be suspicious activity between her 17-year-old daughter and her bus driver ‘Mr. Q.’ Mom says the driver bought her daughter a cell phone. Mom has the phone and found text messages between the two saying: ‘I’m thinking about you’ and ‘what are you doing,'” the January complaint reads. MNPS doesn’t track the resolutions to these complaints so there is no information on if theses accusations were dealt with. Another accusation seems to read like the bus driver was okay with students fighting. “(Parent) states when her son was on the bus in the afternoon route … three male students told her son they were going to jump him. The driver told the students, ‘whatever you do off the bus is up to you.’ Parent states after students got off the bus they jumped her son and busted his head. She feels the driver encouraged the students to jump her son, and didn’t do anything to prevent the incident,” a parent complaint to Metro Schools file in September says. The board and district must act quickly in finding a solution to this problem and investigate all complaints. If bus drivers are having inappropriate relationships with students and encouraging violence, the punishment should be swift and harsh. Thousands of students ride the bus each and every day. Their safety should be the top priority. This will now be the district’s top priority thanks to the reporting of Jason Gonzales. It shouldn’t have taken this long. Palacios said the request of records for bus driver complaints “has been enlightening and identified as a serious priority” by the district. The management tool to monitor how resolutions came about from complaints would also be able to monitor discipline trends and how many drivers were disciplined, she said. School board member Will Pinkston responded to the story on twitter. Uncharacteristically good reporting by @Tennessean. I’ve been complaining about stuff like this since 2014. 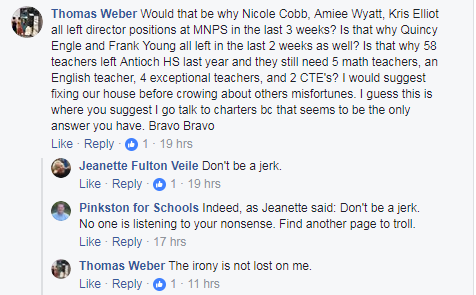 I’m glad @MetroSchools is under new management. The new team is fixing broken processes and creating new processes where none existed. Logical follow-up reporting would be: Jesse Register systematically cut wages and hours @MetroSchools bus drivers, causing many of the most experienced drivers to go elsewhere and leaving the remaining drivers overworked and stressed out. He left behind a mess. The blame Register excuse is getting old from the school board. Jesse Register left Metro Nashville Public Schools on June 30, 2015. MNPS has been without Register for 633 days. The fault from this falls squarely on MNPS and the school board. Acknowledge the issue, fix it, and move on to the next set of issues facing our school system. Don’t spend time blaming others when you have the power to make changes yourself but failed to do so. Blaming the problems of now on a leader who left 633 days ago is poor leadership. Sounds like the nitwits are coming unglued and trying to blame the bus driver stuff on me. Let’s be clear about who did what and when. Let’s not forget who @tennessean attacked for meeting with bus drivers to discuss their poor working conditions. Increased substitute pay. 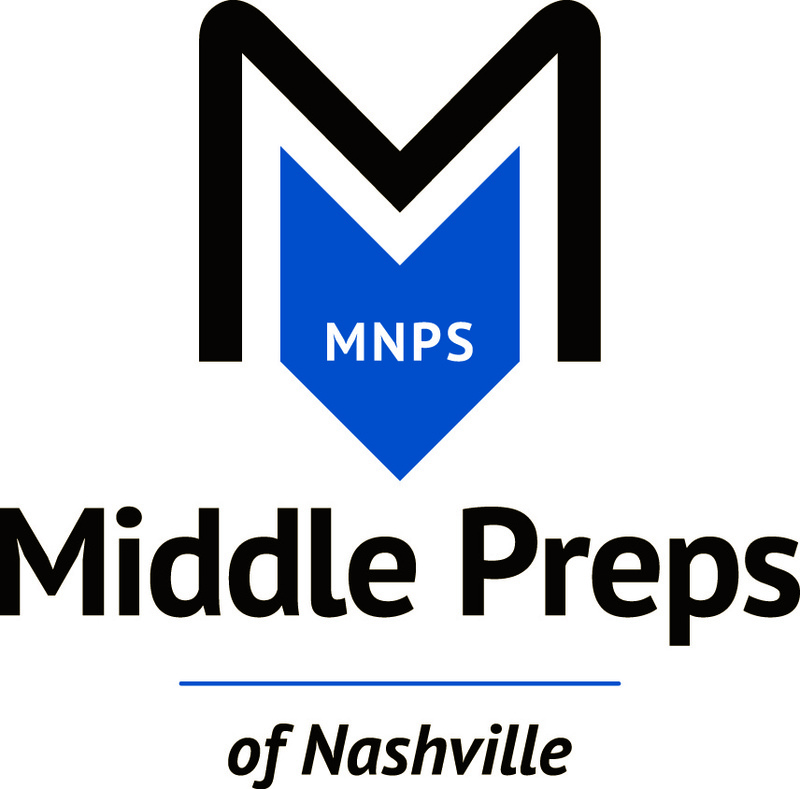 According to Joseph, MNPS will have highest sub pay for middle Tennessee. Dr. Joseph will present the proposed budget to Mayor Megan Barry on April 13. The mayor and the council will have the final say in how much of the proposed budget is funded. I wanted to share some of the graphics that went along with the budget presentation. Test Scores Are In! How Did Our Nashville Students Do? 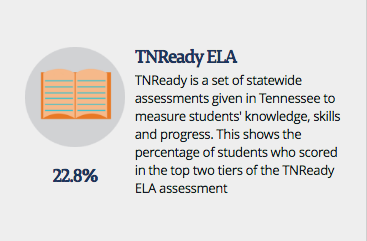 Today, the Tennessee Department of Education released TNReady results for individual districts. The data only show results for high schools because elementary and middle schools did not take the full assessment last school year. For those of you who just want the gist of it, Nashville’s public high schools are struggling to get kids to proficiency, and they’re particularly struggling with math. Let’s dig a little deeper, using some screenshots from the state’s Report Card website. I have written previously about the ACT scores of the district. TNReady is trying to be more aligned with the ACT. 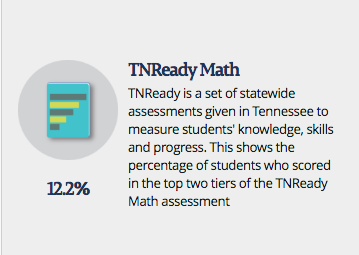 The data show that our high schools are struggling more with math than English language arts (ELA), though each section has only a small percentage of students who are scoring within the top two tiers of TNReady. Here’s the more in-depth breakdown of the data, including individual subjects. As we see from the graph below, we have new terminology to use when discussing the data. The data clearly show that too many high school students are not “on track” nor have achieved mastery of the subjects. We have given our high schools a makeover, but has that makeover really improved the achievement of our students? That will be hard to tell because this is a brand new assessment. The achievement of high school students are more than just a problem with high schools. We need more support in lower grades to give students the skills they need to achieve in high school so that they can graduate and move on to college or a career. It’s great to see that we are showing growth in literacy, but we have to do better in math. Our district has to do better. We have too many students not achieving at the level they should be. I hope our school board will really delve into this issue, instead of spending so much time on petty resolutions that will only hurt the district in the long run. Turning around our district is not something that will make the newspaper tomorrow. It’s not something that you can brag about in your monthly email in a few weeks. Turning around our district takes time, resources, and a vision to help all students achieve. It means that everyone involved in the education system must work together, which can be hard for some. 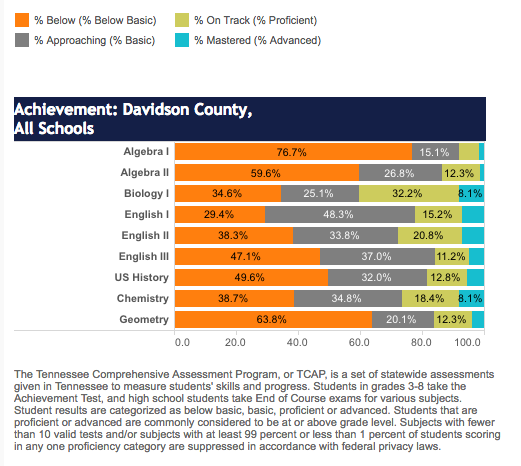 It’s results like this that draw people away from Davidson county and into the suburbs and private schools. We can’t let it continue. Dr. Joseph heard a lot of critiques about Metro Nashville’s middle schools when he arrived in Nashville. He later found out that those critiques were spot on, according to Nashville Public Radio. The newly-hired administrative team held 30 parent listening sessions over the first few weeks. And moms and dads kept talking about middle schools and how they’d like to see them add rigor, more advanced courses and even just a bit more homework. As a middle school teacher, I’ve clearly seen the need for the transformation of middle schools. The district spent so much time transforming high schools that it felt like they forgot about middle schools. While elementary schools are now getting more resources, middle schools got a new name in 2014 (Middle Preps) and were left alone. It’s like needing stitches and throwing a bandaid on it. It’s time for a real transformation and not just a quick fix. It didn’t work in 2014 and it won’t work now. It looks like Dr. Joseph is answering this call. I think too many students are still coming to middle school without basic skills that middle school teachers are not usually equipped to handle. I hope Dr. Joseph will continue to add more support to elementary schools while he is working to transform middle schools. So when will these changes start to take place? “Now is the time to give middle schools the love and attention they need to help strengthen our high school programs,” Joseph says. “We’ll take a bite at the apple next year with more comprehensive plans in year two and three,” he says. On Oct. 10 2016, Teach for America announced that they would be donating $1.3 million worth of printers from Hewlett Packard (HP) to Metro Nashville Public Schools. Why? To help offset the amount of out-of-pocket spending that teachers do every school year. According to Time magazine, a report from the Education Market Association says that on average, teachers spend around $500 on supplies for their classrooms, with one in 10 spending $1,000 or more. Teach for America arranged the donation from HP to reinforce the resources needed in Metro schools every day. Printers started being delivered to every Metro school on Oct. 10, 2016. “We are grateful for the incredible investment HP has made to better the educational opportunities of thousands of public school children throughout the Greater Nashville area,” said Ben Schumacher, Teach for America-Greater Nashville Executive Director. Teach for America has been a partner of Metro Schools since 2009, working to close the opportunity gap for students in low-income communities. Today, 670 Teach for America alumni call Nashville home, with 75 percent of those working full-time in education. Others are working in education policy or for education technology companies like GoNoodle and LiveSchool. Thanks to HP and TFA for the printers! The Metro Nashville school board will begin investigating later start times for their high school students. Right now high schools start at 7:05 in the morning. We know teenager’s body need more sleep (over 9 hours each night) and they also tend to go to bed later and sleep later, which is known as delayed phase preference. Their bodies have a preference to go to bed later. When looking at this issue, we should be asking: What is best for the student? What’s best for high school students are later start times. Here are four reasons why. We all know that it will be difficult, and even expensive, to change the start times for our high schools. If it’s in the best interest of our students, we must do everything possible to make it work. The evidence is out there, so let’s make the policy change and do what’s best for our students.